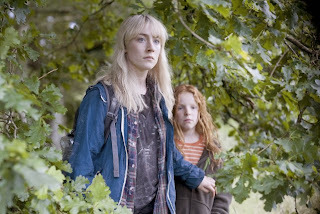 "How I Live Now" stars Saoirse Ronan ("Atonement," "Hanna") as Daisy "don't call me Elizabeth," a nasty no-fun New Yorker sent to summer in the rural English countryside by her never-seen widower dad. Like the alien-possessed rebel Ronan played in this year's earlier sci-fi stinker "The Host," dour Daisy has a nagging voice in her head—but this time it's her own, and it's the apparent reason why she's on meds. With a bad dye job, a nose stud, too much mascara and stylishly ripped tights, Daisy's not a comfortable fit with her younger, perpetually gleeful and storybook-wholesome country cousins. The slightly older Eddie (George MacKay), on the other hand, is a man-of-few-words hawk healer who wins Daisy over when he gently convinces a herd of bovines to wander over yonder. Also, he administers what's supposed to be irresistibly sensual first-aid by putting one of Daisy's bloody fingers in his mouth to clean a wound, which somehow instantly cures her of obsessive-compulsive hand washing. The workaholic single mom of the Blighty brood soon departs for Geneva on a nebulous war-averting mission related to an online bar graph of "Projected Deaths Across Mainland Europe." A neighbor woman who is supposed to take care of Daisy and the cousins never shows up, leaving them on their own to deal with the aftermath of a nuclear explosion in London that leads to deprivations, evacuations and forced separations. Ronan does a good job of transitioning Daisy from churlish to happy-go-lucky to haunted, and both the paradise and purgatory halves of the film are well shot. Also on the plus side, two of Daisy's chilling encounters on her perilous journey more than make up for things like an earlier kids-at-play montage set to an icky Nick Drake number, and the movie ends on an unexpectedly bittersweet note. The plot gives no details about who the life-during-wartime enemy is or what led to the bombing of London, which is a bit frustrating. But director Kevin Macdonald ("The Last King of Scotland") has said that's because the movie is not political but "the story of an unhappy teenage girl falling in love." "How I Live Now" mostly succeeds on those terms, thanks to Ronan's committed and convincing performance.